Finally your search for your Ombre Body Wave Lace Front Human Hair Wigs is over. ➔ We have 9 sizes available from 10", 12" ,14", 16", 18", 20", 22" , 24", 26" inches and with 1B Color Ombre #4 Color. just choose which will fits you most. ➔ Fits the majority of woman's head for the medium size. Small and Large sizes are customized, that need 20days. And if you have any problem you will always get your money back. ➔ Doubleleafwig- The United States Trustworthy Brand. NOT AUTHORIZE, Solely sold by Doubleleafwig. Why wait until tomorrow? 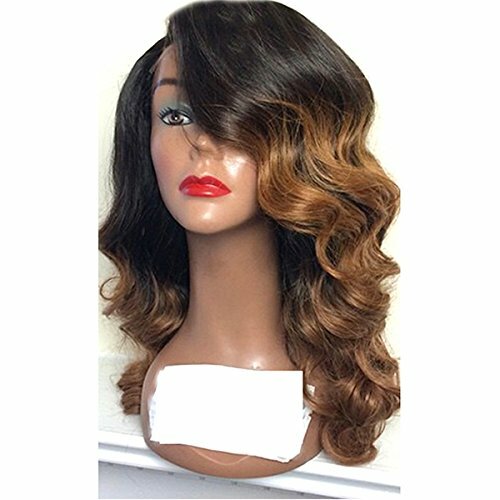 Buy your Brand New Doubleleafwig Body Wave Lace Front Human Hair Ombre Wigs now, simply click ADD TO CART to get this rushed to your door today. ✔ ALL NATURAL - This Body Wave Lace Human Hair Ombre Wigs gives you beautiful results that looks 100% natural. You can wear it in many special occasions. Buy today with confidence! ✔ SMOOTH & SHINY - Best 100% Remy Brazilian Human Hair Lace Wig and 130% density with baby hair. It's soft and tangle-free without any shedding so you can feel comfortable and proud over your new lovely hair. It gives additional charming beauty and attractive looks. ✔ MULTI FIT - Our natural color medium brown Swiss lace can be Straightened, Curled and Bleached. And the medium cap size with adjustable straps at back. ✔ PERFECT GIFT - Soft and gentle to touch and very easy to comb. Our product is 100% odor-free and comes in a great box ready to wrap for a birthday gift, etc. to your friends or to anyone close to you that loves fashion. If you have any questions about this product by Doubleleafwig, contact us by completing and submitting the form below. If you are looking for a specif part number, please include it with your message.